Since 1902, Chevron has been refining crude oil in order to manufacture petroleum products and other chemicals in Richmond, a poor and mostly African American community in Contra Costa County, CA. During the 20th century, the Richmond refinery spread across the area. Today, the company employs 1,200 people and processes approximately 240,000 barrels of crude oil a day into gasoline, jet fuel, diesel and lubricants. Negative health outcomes have been associated with the disproportionate burden of industrial contamination in this area. A recent health study reported that prevalence of asthma among children in Richmond (17%) was double than the national average (7%). Prevalence of asthma among adults that have lived in Richmond for more than 15 years (34.9%) was significantly higher than those more recent residents (9.2%), both higher than the national average (8.7%). Other acute health problems related to air pollution, such as headaches, eye irritation, skin irritation, and respiratory allergies have been identified within these communities. The controversy sparked in 1993, when Chevron made plans to increase its chemical storage and the number of hazardous chemicals in the Richmond area. After not reaching agreements in negotiations with Chevron, local residents tried to lobby public officials to force the company to invest $50 million into community development. The West County Toxics Coalition was able to successfully lobby the Planning Commission in Richmond because it could rally hundreds of citizens. Legal advice from the Golden Gate Law Clinic also helped this community group interpret laws like the CEQA (California Environmental Quality Act) and thus provide powerful evidence that the reformulated fuel plan would have detrimental impacts on children and other vulnerable residents. Chevron ended up paying $5 million. In the 2008 Elections, residents of Richmond approved the Richmond Business License Tax (Measure T), an initiative to bring $10 million additional annual revenue for the city from Chevron to expand community programs. However, in February 2009, Chevron filed a lawsuit in Contra Costa County Superior Court that was ruled on its favour, proclaiming Measure T unconstitutional and voiding it. Since the plant started operating, hundreds of accidents have occurred. The latest was a large explosion and fire that occurred on August 6, 2012. This accident caused more than 15,000 of residents to seek treatment at area hospitals. After the 2012 accident and mass protests (210 protesters were arrested in the one year anniversary of the accident), the city of Richmond filed a lawsuit against Chevron over the fire. In response to this lawsuit, Chevron pleaded no context to six criminal charges and agreed to implement extra oversight of its operation and pay $2 million in fines and restitution. Project Details The refinery processes approximately 240,000 barrels of crude oil a day. The company had 304 accidents between 1989 and 1995 - major fires, spills, leaks, explosions, toxic gas releases, flaring, and air contamination. Other Asthma and other acute health problems related to air pollution: eye irritation, headaches, nosebleeds, respiratory allergies, and skin irritation. Why? Explain briefly. After not reaching agreements in negotiations with Chevron, local residents tried to lobby public officials to force the company to invest $50 million into community development. The West County Toxics Coalition was able to successfully lobby the Planning Commission in Richmond because it could rally hundreds of citizens. Legal advice from the Golden Gate Law Clinic also helped this community group interpret laws like the CEQA (California Environmental Quality Act) and thus provide powerful evidence that the reformulated fuel plan would have detrimental impacts on children and other vulnerable residents. Chevron ended up paying $5 million. Choy, Ellen, and Ana Orozco. "Chevron in Richmond." Race, Poverty, & the Environment 16.2 (2009): 43-46. Cohen, Alison, et al. "Our Environment, Our Health A Community-Based Participatory Environmental Health Survey in Richmond, California." Health Education & Behavior 39.2 (2012): 198-209. Brody, Julia Green, et al. "Linking exposure assessment science with policy objectives for environmental justice and breast cancer advocacy: the northern California household exposure study." American Journal of Public Health 99 (2009). Bernard, Sara. "Henry Clark and Three Decades of Environmental Justice." Richmond Confidential. N.p., 6 Dec. 2012. Web. 08 May 2014. .
Democracy Now. Goodman, Amy. 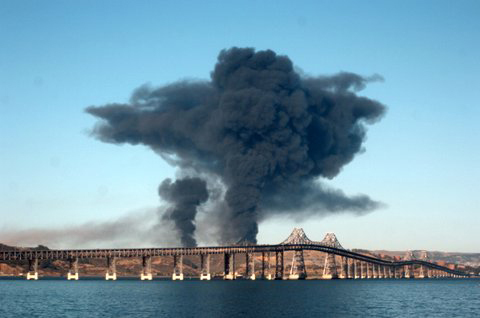 "Chevron to Pay $2 Million for 2012 Refinery Fire in Richmond, CA; 200 Arrested at Protest." Democracy Now! N.p., 6 Aug. 2013. Web. 08 May 2014. . Animation of Fire at Chevron's Richmond Refinery, August 6th 2012. A film produced by the U.S. Chemical Safety and Hazard Investigation Board detailing the sequence of events and cause of the fire (8 mins 15 secs). NBCBayArea. Richmond police have arrested more than 160 protesters for trespassing at a Chevron refinery as part of an environmental protest against the oil industry. Capt. Mark Gagan says more than 2,500 people marched to the Chevron refinery during Saturday's planned nonviolent demonstration in Richmond. Gagan says activists were handcuffed, cited and released after they refused to cease trespassing outside the refinery's main gate. At least 175 arrests had been made by 5 p.m. Saturday, and he expects the total number of arrests to exceed 200. Gagan says there have been no reports of injuries or damage. Saturday's action comes three days before the anniversary of the Aug. 6 explosion that fouled the air, shut down the refinery and sent hundreds of residents to the hospital with breathing complaints. The lawsuit alleges the explosion and blaze at the Richmond refinery on Aug. 6, 2012, resulted from "years of neglect, lax oversight and corporate indifference to necessary safety inspection and repairs."